D.J. Augustin scored the final five points of the game, including a tiebreaking 3-pointer with 3.4 seconds left, as the Orlando Magic upset the host Toronto Raptors, 104-101, in Game 1 of the Eastern Conference quarterfinals on Saturday. The Magic, the seventh seed in the East, won their first playoff game since their most recent postseason appearance in 2012. The Raptors, the second seed, fell to 2-14 all-time in series-opening games. Kawhi Leonard scored four straight points to give the Raptors a 101-99 lead with 1:02 left. After Augustin tied the game with a driving layup with 44.9 left, Marc Gasol’s open 3-pointer from the corner rimmed out. The Magic didn’t call timeout on their way up the floor and Augustin sank the go-ahead basket as the shot clock dwindled. The Raptors called timeout, after which Leonard lofted an air ball from 3-point range from beyond the top of the key. Following a timeout, the Magic inbounded the ball without issue to end the game. Augustin and Leonard each scored 25 points. Evan Fournier added 16 points for the Magic while Aaron Gordon had a double-double with 10 points and 10 rebounds. Jonathan Isaac (11 points), Nikola Vucevic (11 points), Terrence Ross (10 points) and Michael Carter-Williams (10 points) also reached double figures for Orlando. Pascal Siakam had 24 points and nine rebounds for the Raptors. Fred VanVleet scored 14 points off the bench, while Gasol and Danny Green each added 13 points. Kyle Lowry collected eight assists and seven rebounds but was scoreless after missing all seven shots from the field and both free throw attempts. The game featured 13 lead changes and 12 ties, including seven ties in the fourth quarter. Things were especially chaotic in the second and third quarters. The Magic scored 15 consecutive points to cap a 30-7 run that gave them a 57-41 lead with 1:08 to go in the half. But the Raptors ended the second quarter with eight unanswered points in the final 54 seconds. 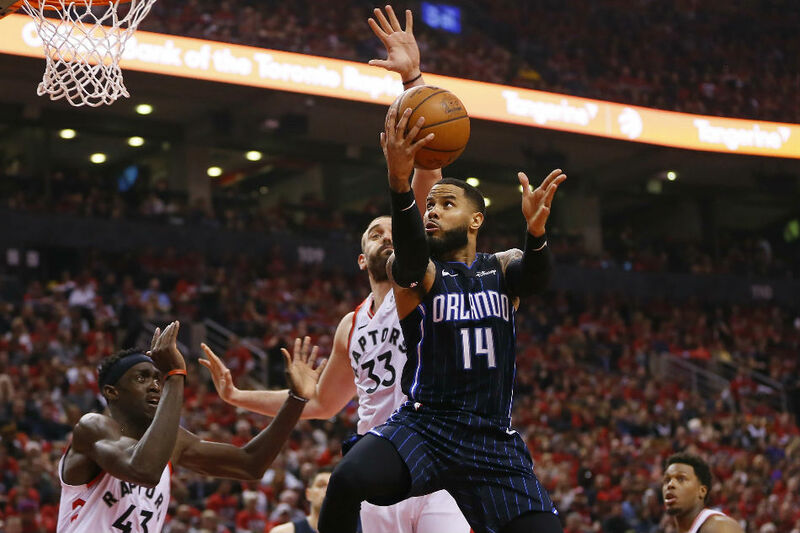 That spurt began a half-spanning 22-2 run for Toronto, which didn’t relinquish the lead until Khem Birch’s dunk 53 seconds into the fourth put the Magic ahead 77-76. Game 2 is set for Tuesday night.